Heavy duty formula for ingrained dirt Low foam, ideal for extraction machine use. Reodourises as it cleans. Also suitable for use as a pre-spotter. High Performance product for professional use. Formulated for use in carpet extraction machines, suitable for use as a pre-spotter when used neat before the extraction process. 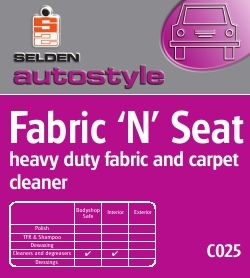 Helps to restore the colour and texture of seat and carpet fabrics. Store in unopened containers in ambient temperatures.